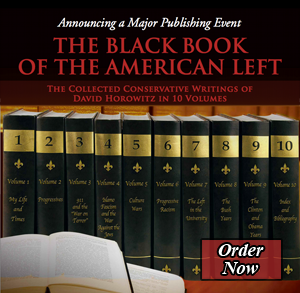 I have just published the second in a projected nine-volume series of my collected writings called The Black Book of the American Left. The title pays homage to The Black Book of Communism, a celebrated European text documenting the crimes of the 20th century’s most notorious progressive experiment. While the original Black Book was a one-volume affair, the literary project I have undertaken is so large as to make it unique in today’s publishing world. Outside the category of literary fiction, so far as I can tell there are no nine-volume series by living authors. So what prompted me to undertake so unwieldy an enterprise, which involves editing a million and a half words and arranging them into themed volumes? The seemingly obvious answer — one my adversaries will certainly seize on — is writer’s vanity. Who would not want to see his words in print and between hard covers? The more the better. But if you take a moment to think about it, this is not an unambiguous advantage and therefore does not provide so obvious an answer. Over the course of a lengthy career I have written roughly 20 full-length books, six or seven of which I consider my best work and the writing I would like others to know me by. But already the 20 volumes threaten to bury some of the better writing I have done and create problems for readers who are seeking to acquaint themselves with my ideas. Where to begin? What to leave out? And given that this is the case, why add nine more volumes, containing a million and a half words, and risk having potential readers throw up their hands and say, “This is too much for me to sort out.” So the question better asked is this: What would The Black Book of the American Left contain that would significantly add to the work I had already done? What would prompt others to read it, and justify the two years of labor that went into the making of it? The answer is in the nature of its contents and — equally important — in concerns I have had about the way conservatives have understood the phenomenon it describes. Five years into the Obama administration, most conservatives have little idea of the depth of its malignancy, or the fact that it is the product of decades of development that has transformed the Democratic party and created, as is rapidly becoming apparent, not only America’s nightmare but the world’s as well. A good place to begin this explanation is by reporting that some readers have remarked critically on the fact that the articles in these volumes, which span some 30 years, have already appeared in print and can be located by a diligent web search. Why then bother arranging them in a new subject order and collecting them in themed volumes with titles like My Life & Times, Progressives, The Great Betrayal (Iraq), Culture Wars, Progressive Racism, and The Left in the Universities? The answer is that these are not articles written on random subjects that happened to catch my fancy. Nor were they written as intellectual exercises that set out to explore various aspects of current issues. They are dispatches from a war zone, written to identify the nature, agendas, and long-term goals of a political movement of historic proportions that is also global in scope. Written in the heat of battle, they are here arranged in chronological order as the events took place, in order to provide a running account of the war itself. The nature of these conflicts as part of an ongoing war was, in my view, scarcely recognized by conservatives at the time, and has still not fully sunk in. Conservatives have rarely approached the individual conflicts with the seriousness they deserve, describing their adversaries as “liberals” — as if they subscribed to the principles of Lockean individualism, tolerance, and political compromise. Only with the advent of the Obama administration have some conservatives begun to connect the dots of origins and outcomes and to grasp the real nature of the national transformation that their adversaries intend. It is for this conservative audience — a constituency on whom the American future depends — that I undertook to put together The Black Book of the American Left. It is first of all a narrative map of the battles fought over the last 40 years and — it must be said – lost, almost every one. The Black Book contains a record as complete as any likely to be written of the struggle to resist a Communist-inspired Left that was not defeated in the Cold War but took advantage of the Soviet defeat to enter the American mainstream and conquer it, until today its members occupy the White House. It is an often overlooked but immensely significant fact that during the Cold War the vast majority of American progressives supported the Communist enemy, working as apologists, appeasers, and enablers for a global movement openly dedicated to the destruction of their country. At the time, the progressive movement was much smaller than it is now and was opposed by mainstream Democrats whom progressives referred to derisively as “Cold War Liberals.” In 1968, progressive activists staged a riot at the Democratic Party convention. The riot was overtly designed to destroy the electoral chances of Hubert Humphrey, regarded as the Cold War Liberal in Chief because of his support for the Vietnam War. The Progressive Party, was formed in 1948 to challenge the cold war liberalism of Harry Truman and was in fact controlled by the Communist Party. The so-called New Left that emerged in the Sixties did not represent a clean break with communism and was not, in fact, a “new” left but a continuation of the old. It developed a modernized, deceptive political rhetoric — calling itself “populist” and even “liberal” — but it was mobilized behind the same malicious anti-individualist, anti-capitalist, and anti-American agendas as the Communist movement from which it sprang. After the convention riot of 1968, this neo-Communist Left marched off the streets and into the Democratic party, and over the next decades took commanding positions in the party’s congressional apparatus, and eventually its national leadership. As it acquired power, it gradually shifted its self- identification from “liberal” to the bolder “progressive,” a designation shared by most leaders of the Democratic Party today. The betrayal of the Vietnamese by the “Watergate” Democrats, the appeasement of Latin American Communists (now firmly entrenched throughout the hemisphere and allied with our enemy Iran), the betrayal of the Iraqis and the sabotage of the war on terror, the traducing of the civil-rights movement and its transformation into a mob led by the racial extortionists Jesse Jackson and Al Sharpton (the latter now the president’s chief adviser on race), the subversion of the modern research university and the conversion of its liberal-arts divisions into doctrinal institutes for training American youth in the radical party line known as political correctness, the rise of a campus fascism aligned with Islamic Jew haters and genocidal terrorists, the political undermining of the public-health system during the AIDS epidemic which led to half a million avoidable deaths — all these were crucial battles lost during the 40 years that preceded the White House reign of Barack Obama. All are documented in the pages of these volumes in week-by-week accounts of the arguments and conflicts that accompanied them. The narrative of these developments is the substance of The Black Book of the American Left. Its fruit is an understanding that the movement now in motion to dismantle the American system, and bring this country to its knees, is no overnight phenomenon and is not the result of misguided idealisms or misunderstandings that can be easily repaired. The adversary cannot be dissuaded, because what drives him is a religious mission on which his identity and quest for a meaningful life depend. He can be stopped only by a political counterforce that is determined and organized, and — most importantly — that understands the gravity of the threat it faces. How far are conservatives from understanding the gravity of the situation they are in? This question was brought home to me the other day as I watched Senator Tom Coburn, easily one of the most decent men in Washington, being interrogated by an unusually frustrated Brian Lamb about his friendship with Barack Obama. That Senator Coburn, a staunch conservative, would relate to the president on a personal level despite their political differences did not bother me. What bothered me was how profoundly the senator misread Obama, how he failed to understand the malice behind either his mendacity or his systematic efforts to dismantle America’s constitutional system and disarm us before our enemies. “He has good intentions,” Coburn assured the exasperated Lamb. In this exchange, Senator Coburn was the picture of American innocence, unable to connect the contempt Obama has shown for the American people and their civil order with his readiness to betray America’s troops in the field and its interests abroad, with his embrace of the Muslim Brotherhood and appeasement of Iranian Hitlerites, with his supine posture toward Russian aggression in the heart of Europe. Conservatives’ conflict with Obama is not about different understandings of the facts among colleagues guided by good intentions. I wanted to ask Coburn whether he thinks the sadistic murderer Fidel Castro, who has turned his nation into an island prison, is also possessed of good intentions and human graces. The director Steven Spielberg, himself a good man, called the eight hours he spent with Castro “the greatest day of my life.” Does this flapdoodle have any real-world significance when it comes to dealing with the radical Left? Unless they are Islamic fanatics, the zealots of the Left do not usually come at you as fire-breathing demons. They come to help. Do you think for a moment that Castro could carry on those nine-hour speeches about Cuba’s glorious socialist achievements if he did not at least half-believe his own fantasies? Obama and Castro are socialist missionaries. For that very reason, the evil they do far exceeds anything achievable by tinhorn tyrants. They are advocates of a cause that turns a blind eye toward the millions of corpses and the wrecked continents of the recent past while attacking the democratic foundations of what remains of a free-market, free-world community of nations, beginning with Israel and the United States. That is their evil and their crime: their will to do it all over again, as if the human calamities they inspired never took place. The idea for these volumes came about as the result of a self-inventory undertaken to map the development of my political views over the last thirty years. This inquiry involved a survey of all the articles and essays I had written as a conservative, that is since the day Peter Collier and I published a cover story in the Washington Post Magazine announcing our “second thoughts” about the left and our departure from its ranks. These writings, which were assembled with the indispensable help of Mike Bauer, added up to more than 690 articles and essays, and a million and a half words. Some were lengthy considerations of “big” issues, others reactions to current events, and some were polemical responses to political opponents. But when I had looked over this body of work, I realized that virtually everything I had written was really about one subject: the American left. The ancient Greek poet Archilochus was the author of a philosophical fragment that became the focus of a famous essay by the writer Isaiah Berlin, which he called “The Hedgehog and the Fox.” In his fragment Archilochus observed, “The fox knows many things, but the hedgehog knows one big thing.” For whatever reason in the many years I have been a writer I have never been a fox. It is true that my subjects have been varied, and I have even authored two volumes of philosophical reflections about mortality and life. But the primary focus of my work — and even of those thoughts on mortality and existence — has remained one big thing: the nature, deeds, and fortunes of the political left. The first part of my life was spent as a member of the “New Left” and its Communist predecessor in which my family had roots. After the consequences of those commitments became clear to me in the mid-1970s, I came to know theleft as an adversary, and — if sheer volume is the measure — its principal intellectual antagonist. Some have seen my efforts to define the left and analyze what it intends as an obsession. In a sense that is true: I had left the left, but the left never leftme. For better or worse, I have been condemned to spend the rest of my days attempting to understand how it pursues the agendas from which I have separated myself, and why. When I was beginning this quest nearly three decades ago, I paid a visit to the New York intellectual, Norman Podhoretz, who had had his own second thoughts a decade earlier, though not from so radical a vantage as mine. Podhoretz asked me why I was spending my time worrying about an isolated community on the fringes of politics. I should focus, he said, on liberals not leftists. This advice reflected what seemed an accurate description of the political landscape at the time. Many would have seconded his judgment when the walls of Communism came tumbling down shortly thereafter. But the progressive faith is just that, a faith, and despite the exceptions of individual cases no facts on the ground will dispel it. When Podhoretz and I met, progressives and radicals had already escaped the political ghettos to which my parents’ generation had been reasonably confined. The massive defeat they then suffered in the fall of the Marxist states they helped to create had the ironic and unforeseen effect of freeing them from the burden of defending it. This allowed them in the next decade to emerge as a major force in American life. In the wake of the Communist collapse, this left has become a very big thing – so big that by 2008 it was the dominant force in America’s academic and media cultures, had elected an American president, and was in a position to shape America’s future. Because of its post-Communist metastasis, what Norman Podhoretz saw as a parochial interest in a fringe cause had become an effort to understand the dominant development in American politics culture over the last fifty years. That is the subject of these volumes. The essays contained herein describe the left as I have known it — first from the inside, as one of its leading “theorists” (I flinch and blush at the same time in using this term), and then as a nemesis confronting it with the real world consequences of its actions. In all these writings I was driven by two urgencies: a desire to persuade those still on the left of the destructive consequences of the ideas and causes they promoted; and second, the frustration I experienced with those conservatives who failed to understand the malignancy of the forces mobilized against them. Most conservatives habitually referred to leftists who were determined enemies of the American social contract and its individual liberties as “liberals.” In calling them liberals, they failed to appreciate the Marxist foundations and religious dimensions of their radical faith or the hatreds it inspired. And they failed to appreciate their brutal imposture in stealing the identity of the intellectually pragmatic, patriotic, and anti-totalitarian “Cold War liberals” whose influence in American political life they killed off, beginning in 1972 with the McGovern coup inside the Democratic Party. When this syllabus of my conservative writings was finally assembled and I had read their contents through, I realized that even though collecting them would take up multiple-volumes, they added up to a single book, which my colleague Peter Collier quickly christened “The Black Book of the American Left.” Contained in these multi-volumes is a diary written over more than half a century that describes one man’s encounters with a movement, which — in the words of Barack Obama, its most prominent figure — is seeking to “fundamentally transform the United States of America.” The diary records the progress of that transformation, documenting the changes of a shape-shifting movement that constantly morphs itself in order to conceal its abiding identity and mission, which, as these pages will make clear, is ultimately one of destruction. It is almost a certainty that no other “book” will be written like this one, since it can only have been the work of someone born into the left and condemned Ahab-like to pursue it in an attempt to comprehend it. Yet it is not simply a project of monomania, as my adversaries will suggest, but of discovery — an attempt not only to understand a movement but to explore its roots in individual lives, including my own. While I hope this book may be useful to those fighting to defend individual freedom and free markets, I do not deceive myself into believing that I have finally set the harpoon into the leviathan, a feat that is ultimately not possible. Progressivism is fundamentally a religious faith, which meets the same eternal human needs as traditional faiths, and for that reason will be with us always. In the last analysis, the progressive faith is a Gnosticism that can only be held at bay but never finally beaten back to earth.